Get into the groove... Follow Lin's lead for all the right real estate moves. Good Time to buy? Sell? The market Beats to it's own drum - tune in for the latest tempo trends. The Beat goes on... Set the stage for a perfect performance. Learn Lin's secrets to getting your home sold. Find the property that hit's all the right notes! Search for your dream home now. "We had a wonderful experience with Lin as our realtor. She would consistently go above and beyond our expectations, including frequent and flexible showings, giving us her honest and credible opinions, and helping us find the right home for our particular needs. If she didn't know the answer to our questions she put real effort into finding someone who did. Everything was done in an efficient and careful manner. I especially appreciated that it was absolutely clear that she was working for our best interest and not just phoning it in to make a quick sale." Our family is forever grateful, thank you so much Lin..You're the best��❤️Sylvia and Michael. My partner and I recently purchased our first home in March of this year all thanks to the help of the amazingly talented Lin Elder. With my partner living in another city this task was put solely on myself leaving me going to open houses alone and surfing listings online. I met Lin at an open house and she was so thorough and direct with what I was looking for, I left feeling like this search was going to now become a breeze. Over the new 6 weeks Lin?s online search sent us off looking at many, many inner city condos in her convenient pick up service, this was so helpful since I do not own a vehicle hence the need for an inner city home! When we walked into the ?one" I immediately knew it was right, as did Lin. I couldn't have been luckier to have such a warm hearted, supportive and knowledgeable realtor on my side, my search was 100% painless and actually quite fun! Lin was even helpful to set me up with a lawyer to complete the stress-free process. I would recommend Lin 1000 times to anyone looking to buy their first, 2nd, 3rd or last home!! Lin was wonderful to work with!! She really listened to us and had a good understanding of what we wanted. Every house she showed us was better than the previous one. She was friendly, caring, knowledgeable and responsive. On top of everything, we must have been challenging clients! We're first time home owners and we often found ourselves a bit nervous or unsure. Also, we were relocating cities and Lin sometimes needed to communicate with our relatives in Calgary. Lin did a wonderful job of walking us through the steps involved with purchasing our first home and beyond (reminders to hook up utilities, recommendations on lawyers to use, etc.) We would recommend Lin to anyone looking for their dream home in Calgary. There is no doubt that lin possesses all of the qualities one would expect of a real estate agent. She has local knowledge and experience. She is very organized and pays attention to details. She is tenacious and an absolute advocate for her client. She is hard working and conducts herself professionally with honesty and integrity. But lin?s skills go beyond expectation. She consistently went above and beyond in both the sale of one home and the purchase of another. She was patient, kind, understanding and supportive. I can truly say that what began as a real estate agent/client relationship grew into a lasting friendship. lin is a gem and a pleasure to work with. I am forever grateful for her assistance and whole heartedly recommend her. Thank you lin for EVERYTHING! Recent Blog Entries April 15th, 2019. BoOm chUka lUka luKa! Bust a mOve! This weeks Market RHYTHM for APRIL 15th, 2019. SPRING market brings SUNSHINE and many new GREAT listings! 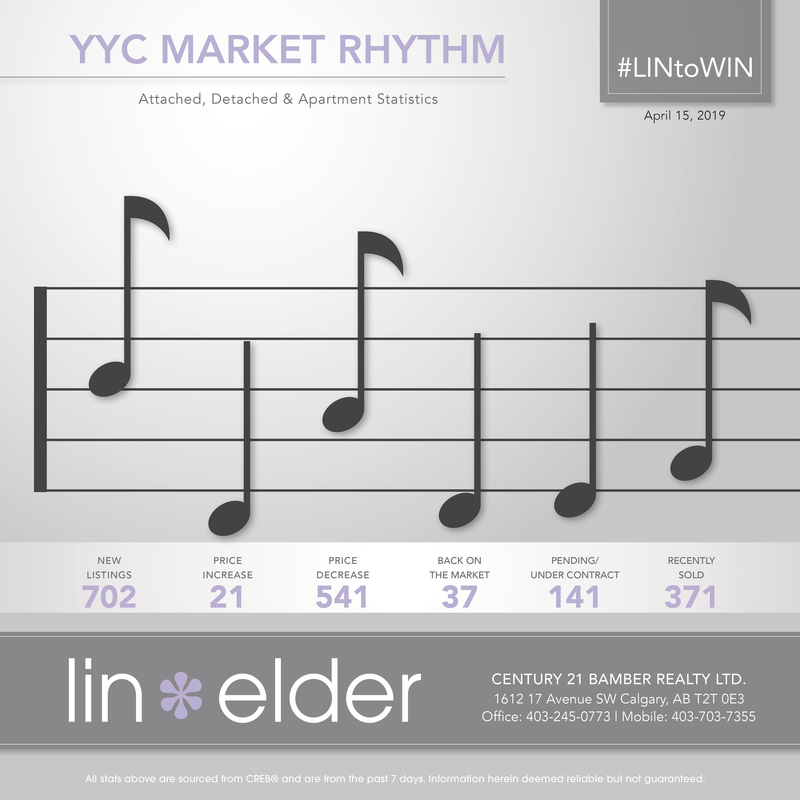 Check out YYC's Market RHYTHM for April 15th, 2019. Let the RHYTHM mOve yOu. BoOm! "Welcome to my premiere real estate website..."
I look forward to helping you make your best real estate decision in todays market!